New York Lead Paint Experts of New York City is an EPA Lead Safe certified firm for lead testing and lead abatement services throughout New York City. 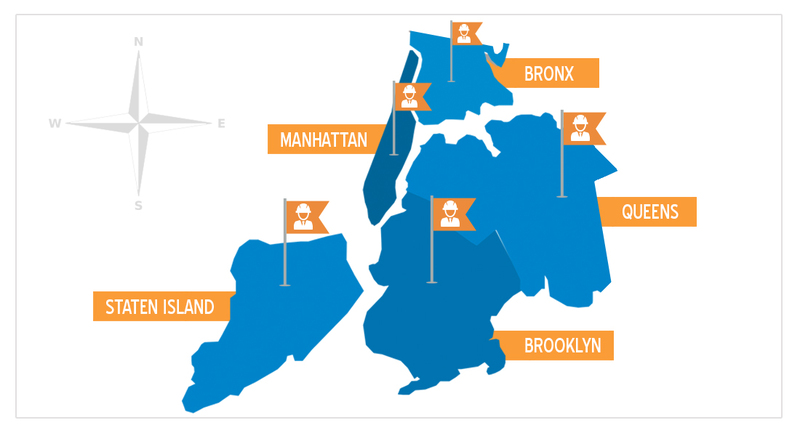 We have locations in Manhattan, Queens & Brooklyn and our crews service all five NYC Burroughs. Our firm specializes in the removal of NYC HPD & DOH lead violations through appropriate testing and abatement procedures. We have years of industry experience and have successfully helped hundreds of clients. Lead is a natural element, that has some practical uses in our society, but is toxic to humans and animals. The reality is that lead is present in many of our homes, apartments and office buildings. The most common places that lead is found is in paint, dust, soil and water. In New York City lead-based paint hazards are presumed to exist if: the building was built before 1960 (or between 1960 and 1978 if the owner knows that there is lead-based paint), the building has three or more apartments, a child under the age of six lives in the apartment. Lead is particularly dangerous to children because their growing bodies absorb more lead than adults do and their brains and nervous systems are more sensitive to the damaging effects of lead. Babies and young children can also be more highly exposed to lead because they often put their hands and other objects that can have lead from dust or soil on them into their mouths. The HPD & DOH are both New York City governmental agencies that issue lead violations to property owners and building management companies who rent out homes or apartments. NYC protects tenants rights by requiring by law that owners/managers take appropriate steps to test for and remove any lead hazards that exist on their property. Furthermore, they require that all testing and abatement services be conducted by an EPA Lead Safe certified firm. Both agencies encourage tenants to report any known or suspected lead hazards in the properties they occupy. New York Lead Paint Experts has the necessary EPA certifications to provide lead testing and lead abatement services on properties throughout New York City. Dealing with HPD & DOH violations can be a stressful experience. NYLPE is here to help you get through it. Our project managers have the experience and know-how to guide you through the violation removal process in order to successfully remove the violation and make your property lead safe for your family and/or tenants. Whether you are responding to a lead violation notice, selling or buy a property, or taking proactive measures to test for or abate lead, NYLPE can provide you with skilled and experienced services. We can help guide you through the lead testing and lead abatement process. Call today to schedule a consultation with one of our EPA Lead Safe certified professionals. New York Lead Paint Experts is an EPA Lead-Safe certified firm with a reputation for safety, quality work, and excellent customer service. NYLPE has years of experience servicing and consulting homeowners, landlords, management companies, state agencies and educational facilities throughout New York City’s five boroughs. If you are a landlord, building manager, or looking to rent or buy an apartment or house in New York, testing for lead is an important step.